I had a post on anemia in the works, complete with details on the structure, function, and production of red blood cells, but I got sidetracked by coffee cake. Iron-poor blood will have to wait. This cake is that good. Plus, it fits in with a study I read this morning. It’s the holidays and this time of year often triggers an uptick in anxiety-related behavior. Cake is comfort food. Did you go to Target or Best Buy on Black Friday? Did your Thanksgiving dinner look more like a Woody Allen movie than a Norman Rockwell painting? Are you stressed about work, money, politics, the weather? Here, have a piece of cake. Really? It took 17 scientists to confirm that we want cake, cookies, and ice cream when we’re stressed? Since I’m in the Christmas spirit and this coffee cake is so divine, I won’t belabor the unintended consequences of overeating hedonic (sorry, that word is just too much fun) food for stress relief. Yes, we know that binging on sweets is not a good idea. But who reaches for bok choy or burdock root when they’re stressed? And, yes, we know that eating high fat, high carb food can lead to diabetes, heart disease, cancer, and blah-blah-blah. Let’s put all that aside for now, take this one bite at a time, and enjoy the holidays responsibly. I’m for baking an occasional treat, sharing it with friends and family, and not over-indulging. I created this coffee cake recipe for a holiday brunch I’m having on Christmas day. When I perfected the recipe on my third try, I gave half of it to my neighbors (reluctantly). When I make it next time, I’ll have lots of people to share it with. I’m taking protective measures, but I still plan to enjoy a little hedonic buzz now and then. 1. Preheat oven to 350°. Butter a 9 x 9 inch square baking pan (I used a dark 9 x 9 inch square baking pan). 2. Place Pamela’s mix and the pumpkin pie spice in a medium bowl. Whisk to blend the two dry ingredients. 3. Beat butter and sugar together on medium speed, about 30 seconds, until creamy. Add eggs, vanilla, coconut milk, and pumpkin pie mix and continue mixing on low, about 30 seconds to 1 minute. 4. Add dry ingredients to wet and mix on low until well blended. 5. Spoon into baking pan and spread evenly. You may need to use a wet knife to spread the batter. 6. To prepare the streusel topping: Place Pamela’s mix, turbinado sugar, and chopped pecans in a medium bowl. Stir to mix. Cut in chilled butter (I use a cheese grater) and mix well. Sprinkle over batter. 7. Place coffee cake on center rack of oven and bake for 45 minutes. Check after 20 to 30 minutes and cover loosely with foil if the streusel starts over-browning (it will, so watch it). You want it nicely browned, not burned. 8. Cool slightly and serve. You can make this a day ahead if you’d like. It’s almost better the next day. * Organic Turbinado sugar, also called raw cane sugar, is made by the first crushing of freshly-cut sugar cane. It’s still sugar, but less refined and grown organically. The crystals are larger and crunchier and have a molasses flavor to them. Molasses is a byproduct of the process and retained in Turbinado sugar. It’s perfect for streusel topping. Peace, love, and hedonic food (in small doses on special occasions). This entry was posted on Wednesday, November 28th, 2012 at 7:38 am	and is filed under Gluten-Free Recipes, Miscellaneous. You can follow any responses to this entry through the RSS 2.0 feed. You can leave a response, or trackback from your own site. Looks good, but I’m eagerly awaiting the article on anemia. I was diagnosed 8 years ago through anemia and I was recently told I was anemic again. SIGH. Thanks! I usually get “unsubscribe” emails when I post science stuff, but that never stops me. =) I’ll finish the anemia post and publish it next week. Gosh, that’s a drag. Anemia is one of the most common adult presentations of celiac disease, but normally things get better once you’ve been off gluten. Are you eating a high-iron diet? Using a cast iron skillet. I have a blog post somewhere on that. I’ll dig it up and post it on Facebook. I’ll link to you so you know. BTW, it looks like you had a wonderful time on your globe-trotting adventure. Thanks for posting the pictures! Divine. It looks divine. THANK YOU for sharing! And/But I too look forward to the anemia post. Yes, it actually is divine! This one was a winner. Oh good, glad to hear there are 2 of you interested in the anemia post. =) Love you science nerdettes! Make that three! Guess we’ll just have to eat cake while we wait. 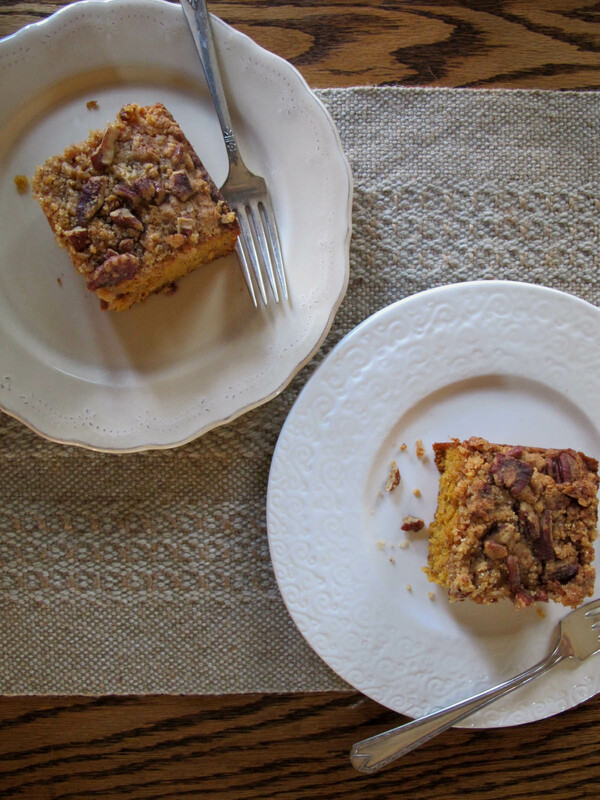 Oh, YUM … pumpkin pie and coffee cake come together! A girl’s dreams can come true. I guess the “duh” factor with that study is similar to the one that said folks were indulging in more comfort food because of the bad economy. I don’t mind indulgence in such treats, but more and more I have to take proactive measures like you … only bake when others are around, giving away a good portion of whatever I bake, etc. I love not just the delicious results of baking, but also the physical act of measuring, mixing, etc. The whole process is therapeutic for me. It quiets my brain and makes me feel happy. I wonder if there’s a study on that, or maybe it’s just all tied to the end result somehow. Hmmm. I know the anemia post will be appreciated by many. I will look forward to sharing it with my group, FB readers, etc. for sure! I’m sure there’s a study on the therapeutic benefits of playing with food. I’ll keep my eye out for that one. It can be a meditative endeavor for me, that’s for sure. “Hedonic” is a fantastic word! Thanks for bringing it along with this delicious-looking recipe! It might just have to show up (veganized) at my Christmas morning table, too! Mmmm…this looks so good. I need pumpkin coffee cake. I have leftover pumpkin (well, butternut, but whatever) puree in the fridge, and I think I need this ASAP. Yum! This looks amazing Melissa. I definitely don’t need any scientists to tell me that I want sweets when stressed! Well, this “science and research nerd” will never unsubscribe. I LOVE your articles. Thanks! Bring on the science and anemia posts. My Dad suffered from inexplicable anemia (his entire life) and he developed the seriously tanked hematocrits that required dozens of blood transfusions for 8 years. Even docs at the prestigious Lahey Clinic outside of Boston could not figure it out. Fast forward, his only (biological) child becomes so ill and incapacitated after his death and she goes downhill for 3 years….no one can explain why. She has severe B-12 and Folate anemias (the other 2 most common deficiencies in celiac) among the dozens of symptoms (hair loss, weight loss-90 lbs., anxiety that makes no sense, and horrid joint/muscle/nerve pain etc. etc.) that tried to kill her. Yup, that’s me…the Celiac. I figured it out myself and was finally DXed in Nov. 2010. In retrospect, I SEE it NOW in my Dad (his GI distress since his 20′s, his chronic itching and kidney malfunction and “GERD”, high BP and cholesterol and heart palps, etc. ) and I try not to beat myself up over it, but if I only knew back then what I know now….well, he may well still be alive. I cannot turn the clock back, but I spend my time helping others I see with anemia and other issues that yell “hey, I am a celiac ! !” to get a proper DX. but I digress, so sorry. On to the more important topic at hand….this recipe looks DE-LISH and hedonistic…and who doesn’t love pumpkin!? Thanks for all you do to help the GF community, Melissa. My house smells wonderful on this wet, rainy Christmas Eve Day now that I have baked the pumpkin coffee cake for our breakfast in the morning. Thanks again!! Have a wonderful holiday with your family & happy skiing!! This coffee cake is amazing!!! I had granddaughters fighting over who was taking it home with them!! I did share some but said “it stays here! !